"Maps" redirects here. For other uses, see Maps (disambiguation). 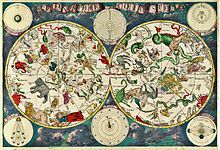 A map is a symbolic depiction emphasizing relationships between elements of some space, such as objects, regions, or themes. Many maps are static, fixed to paper or some other durable medium, while others are dynamic or interactive. Although most commonly used to depict geography, maps may represent any space, real or fictional, without regard to context or scale, such as in brain mapping, DNA mapping, or computer network topology mapping. The space being mapped may be two dimensional, such as the surface of the earth, three dimensional, such as the interior of the earth, or even more abstract spaces of any dimension, such as arise in modeling phenomena having many independent variables. Road maps are perhaps the most widely used maps today, and form a subset of navigational maps, which also include aeronautical and nautical charts, railroad network maps, and hiking and bicycling maps. In terms of quantity, the largest number of drawn map sheets is probably made up by local surveys, carried out by municipalities, utilities, tax assessors, emergency services providers, and other local agencies. Many national surveying projects have been carried out by the military, such as the British Ordnance Survey: a civilian government agency, internationally renowned for its comprehensively detailed work. In addition to location information, maps may also be used to portray contour lines indicating constant values of elevation, temperature, rainfall, etc. 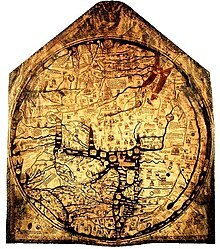 The Hereford Mappa Mundi from about 1300, Hereford Cathedral, England, is a classic "T-O" map with Jerusalem at centre, east toward the top, Europe the bottom left and Africa on the right. The orientation of a map is the relationship between the directions on the map and the corresponding compass directions in reality. The word "orient" is derived from Latin oriens, meaning east. In the Middle Ages many maps, including the T and O maps, were drawn with east at the top (meaning that the direction "up" on the map corresponds to East on the compass). The most common cartographic convention is that north is at the top of a map. Polar maps of the Arctic or Antarctic regions are conventionally centred on the pole; the direction North would be towards or away from the centre of the map, respectively. Typical maps of the Arctic have 0° meridian towards the bottom of the page; maps of the Antarctic have the 0° meridian towards the top of the page. Reversed maps, also known as Upside-Down maps or South-Up maps, reverse the North is up convention and have south at the top. Ancient Africans including in Ancient Egypt utilised this orientation, as some maps in Brazil do today. Cartogram: The EU distorted to show population distributions as of 2008. Some maps, called cartograms, have the scale deliberately distorted to reflect information other than land area or distance. For example, this map (at the right) of Europe has been distorted to show population distribution, while the rough shape of the continent is still discernible. Another example of distorted scale is the famous London Underground map. The basic geographical structure is respected but the tube lines (and the River Thames) are smoothed to clarify the relationships between stations. Near the center of the map stations are spaced out more than near the edges of map. Further inaccuracies may be deliberate. For example, cartographers may simply omit military installations or remove features solely in order to enhance the clarity of the map. For example, a road map may not show railroads, smaller waterways or other prominent non-road objects, and even if it does, it may show them less clearly (e.g. dashed or dotted lines/outlines) than the main roads. Known as decluttering, the practice makes the subject matter that the user is interested in easier to read, usually without sacrificing overall accuracy. Software-based maps often allow the user to toggle decluttering between ON, OFF and AUTO as needed. In AUTO the degree of decluttering is adjusted as the user changes the scale being displayed. Geographic maps use a projection to translating the three-dimensional real surface of the geoid to a two-dimensional picture. Projection always distorts the surface. There are many ways to apportion the distortion, and so there are many map projections. Which projection to use depends on the purpose of the map. The various features shown on a map are represented by conventional signs or symbols. For example, colors can be used to indicate a classification of roads. Those signs are usually explained in the margin of the map, or on a separately published characteristic sheet. Some cartographers prefer to make the map cover practically the entire screen or sheet of paper, leaving no room "outside" the map for information about the map as a whole. These cartographers typically place such information in an otherwise "blank" region "inside" the map—cartouche, map legend, title, compass rose, bar scale, etc. In particular, some maps contain smaller "sub-maps" in otherwise blank regions—often one at a much smaller scale showing the whole globe and where the whole map fits on that globe, and a few showing "regions of interest" at a larger scale in order to show details that wouldn't otherwise fit. Occasionally sub-maps use the same scale as the large map—a few maps of the contiguous United States include a sub-map to the same scale for each of the two non-contiguous states. Maps of the world or large areas are often either 'political' or 'physical'. The most important purpose of the political map is to show territorial borders; the purpose of the physical is to show features of geography such as mountains, soil type or land use including infrastructure such as roads, railroads and buildings. 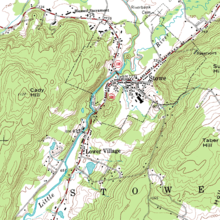 Topographic maps show elevations and relief with contour lines or shading. Geological maps show not only the physical surface, but characteristics of the underlying rock, fault lines, and subsurface structures. From the last quarter of the 20th century, the indispensable tool of the cartographer has been the computer. Much of cartography, especially at the data-gathering survey level, has been subsumed by Geographic Information Systems (GIS). The functionality of maps has been greatly advanced by technology simplifying the superimposition of spatially located variables onto existing geographical maps. Having local information such as rainfall level, distribution of wildlife, or demographic data integrated within the map allows more efficient analysis and better decision making. In the pre-electronic age such superimposition of data led Dr. John Snow to identify the location of an outbreak of cholera. Today, it is used by agencies of the human kind, as diverse as wildlife conservationists and militaries around the world. 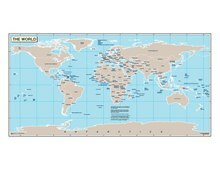 A world map in PDF format. Typically (2) applies to a Portable Document Format (PDF) file or other format based on vector graphics. The increase in detail is limited to the information contained in the file: enlargement of a curve may eventually result in a series of standard geometric figures such as straight lines, arcs of circles or splines. (1) may apply to the text as needed (displaying labels for more features), while (2) applies to the rest of the image. Text is not necessarily enlarged when zooming in. Similarly, a road represented by a double line may or may not become wider when one zooms in. See also: Webpage (Graphics), PDF (Layers), MapQuest, Google Maps, Google Earth, OpenStreetMap or Yahoo! Maps. The maps that reflect the territorial distribution of climatic conditions based on the results of long-term observations are called climatic maps. These maps can be compiled both for individual climatic features (temperature, precipitation, humidity) and for combinations of them at the earth's surface and in the upper layers of the atmosphere. Climatic maps afford a very convenient overview of the climatic features in a large region and permit values of climatic features to be compared in different parts of the region. 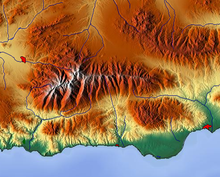 Through interpolation the maps can be used to determine the values of climatic features in any particular spot. Climatic maps generally apply to individual months and to the year as a whole, sometimes to the four seasons, to the growing period, and so forth. On maps compiled from the observations of ground meteorological stations, atmospheric pressure is converted to sea level. Air temperature maps are compiled both from the actual values observed on the surface of the earth and from values converted to sea level. The pressure field in free atmosphere is represented either by maps of the distribution of pressure at different standard altitudes—for example, at every kilometer above sea level—or by maps of baric topography on which altitudes (more precisely geopotentials) of the main isobaric surfaces (for example, 900, 800, and 700 millibars) counted off from sea level are plotted. The temperature, humidity, and wind on aeroclimatic maps may apply either to standard altitudes or to the main isobaric surfaces. Isolines are drawn on maps of such climatic features as the long-term mean values (of atmospheric pressure, temperature, humidity, total precipitation, and so forth) to connect points with equal values of the feature in question—for example, isobars for pressure, isotherms for temperature, and isohyets for precipitation. Isoamplitudes are drawn on maps of amplitudes (for example, annual amplitudes of air temperature—that is, the differences between the mean temperatures of the warmest and coldest month). Isanomals are drawn on maps of anomalies (for example, deviations of the mean temperature of each place from the mean temperature of the entire latitudinal zone). Isolines of frequency are drawn on maps showing the frequency of a particular phenomenon (for example, annual number of days with a thunderstorm or snow cover). Isochrones are drawn on maps showing the dates of onset of a given phenomenon (for example, the first frost and appearance or disappearance of the snow cover) or the date of a particular value of a meteorological element in the course of a year (for example, passing of the mean daily air temperature through zero). Isolines of the mean numerical value of wind velocity or isotachs are drawn on wind maps (charts); the wind resultants and directions of prevailing winds are indicated by arrows of different length or arrows with different plumes; lines of flow are often drawn. Maps of the zonal and meridional components of wind are frequently compiled for the free atmosphere. Atmospheric pressure and wind are usually combined on climatic maps. Wind roses, curves showing the distribution of other meteorological elements, diagrams of the annual course of elements at individual stations, and the like are also plotted on climatic maps. Maps of climatic regionalization, that is, division of the earth's surface into climatic zones and regions according to some classification of climates, are a special kind of climatic map. Climatic maps are often incorporated into climatic atlases of varying geographic range (globe, hemispheres, continents, countries, oceans) or included in comprehensive atlases. Besides general climatic maps, applied climatic maps and atlases have great practical value. Aeroclimatic maps, aeroclimatic atlases, and agroclimatic maps are the most numerous. Maps exist of the Solar System, and other cosmological features such as star maps. In addition maps of other bodies such as the Moon and other planets are technically not geographical maps. In a topological map, like this one showing inventory locations, the distances between locations is not important. Only the layout and connectivity between them matters. 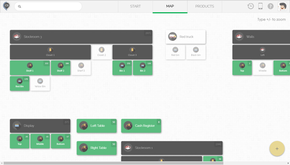 Diagrams such as schematic diagrams and Gantt charts and treemaps display logical relationships between items, rather than geographical relationships. Topological in nature, only the connectivity is significant. The London Underground map and similar subway maps around the world are a common example of these maps. General-purpose maps provide many types of information on one map. Most atlas maps, wall maps, and road maps fall into this category. The following are some features that might be shown on general-purpose maps: bodies of water, roads, railway lines, parks, elevations, towns and cities, political boundaries, latitude and longitude, national and provincial parks. These maps give a broad understanding of location and features of an area. The reader may gain an understanding of the type of landscape, the location of urban places, and the location of major transportation routes all at once. Within Russia, Google Maps shows Crimea as part of Russia. Both the Republic of India and the People's Republic of China require that all maps show areas subject to the Sino-Indian border dispute in their own favor. In 2010, the People's Republic of China began requiring that all online maps served from within China be hosted there, making them subject to Chinese laws. ^ Ordnance Survey, Explorer Map Symbols Archived 3 April 2016 at the Wayback Machine; Swisstopo, Conventional Signs Archived 28 May 2008 at the Wayback Machine; United States Geological Survey, Topographic Map Symbols Archived 1 June 2008 at the Wayback Machine. ^ Imhof, E., “Die Anordnung der Namen in der Karte,” Annuaire International de Cartographie II, Orell-Füssli Verlag, Zürich, 93–129, 1962. ^ Freeman, H., Map data processing and the annotation problem, Proc. 3rd Scandinavian Conf. on Image Analysis, Chartwell-Bratt Ltd. Copenhagen, 1983. ^ Chappell, Bill (12 April 2014). "Google Maps Displays Crimean Border Differently In Russia, U.S." NPR.org. Retrieved 6 September 2018. ^ Wagstaff, Jeremy (23 March 2012). "Google charts a careful course through Asia's maps". Reuters. Retrieved 6 September 2018. ^ Guanqun, Wang (19 May 2010). "China issues new rules on Internet map publishing". Xinhua News Agency. Archived from the original on 27 May 2016. Retrieved 27 July 2016. Ahn, J. and Freeman, H., “A program for automatic name placement,” Proc. AUTO-CARTO 6, Ottawa, 1983. 444–455. Freeman, H., “Computer Name Placement,” ch. 29, in Geographical Information Systems, 1, D.J. Maguire, M.F. Goodchild, and D.W. Rhind, John Wiley, New York, 1991, 449–460. Geography and Maps, an Illustrated Guide, by the staff of the U.S. Library of Congress.